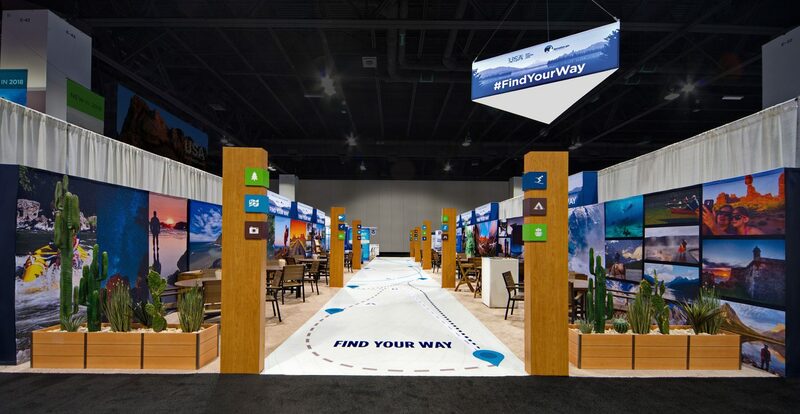 How do you freshen up an existing exhibit booth design? Better yet, how do you do this when the space includes 10+ partner booths, each of which needs to retain its own brand identity while being connected by one cohesive theme? 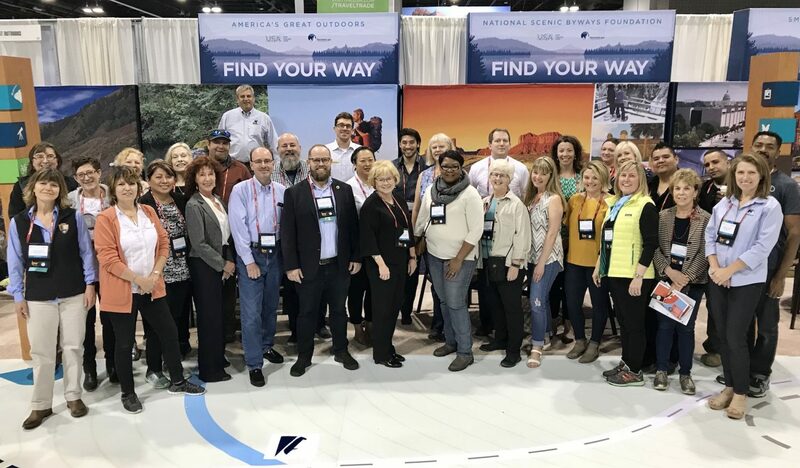 For the 50th anniversary of IPW, the world’s leading travel trade show, NB traveled to Denver, Colorado, to represent Great Outdoors USA for the fifth year. We united a group of individual partner booths under a larger umbrella representing the USA, giving the space a much larger presence in the large exhibit hall. And we enhanced the existing design to give the booths a fresh twist while maintaining the outdoorsy, American look-and-feel that IPW visitors have come to recognize. It all begins with branding, which we applied to anchoring pieces, like hanging banners. We started with a conversation (a key ingredient to a successful partnership) to determine how the overarching theme would shape the design. Details can go a long way. 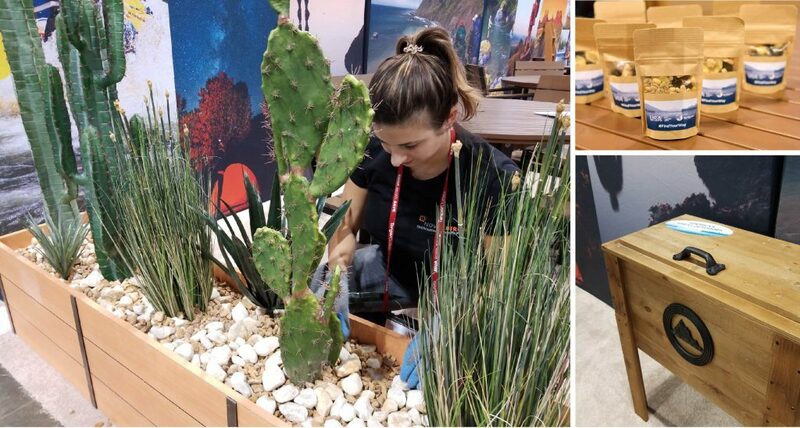 Fun additions this year helped create an atmosphere of trailblazing adventure with planters filled with cacti and grasses, branded trail mix, a custom illustration of Mt. Hood, and branded camping coolers for storage and set dressing. In this year’s design, we reused backdrop structures but updated the graphics, resulting in not only a fresh look, but also cost savings for our client. And here’s a pro tip: Invest in carpet that will last for multiple shows based on your predicted foot traffic. Bring the excitement with upgrades like cool new giveaways! Timely and honest communication with a great team makes all the difference. Discuss your priorities and goals for this year, and see where you can spruce up the existing design. When we embark on new partnerships, we always take a long-term approach. How can we think strategically to get the most out of your investment? How can we give an existing design a fresh feel and deliver an engaging experience that welcomes visitors? It’s a challenge we’re always ready to take on. Looking to partner on a booth design that will continue to engage your audiences and represent your brand year after year?